I just got back from an overnight trip to the Jersey shore. I had a lot of fun, and ate lots of junk food, but now I'm home and I'm tired, and lazy. What better time to cook up a freezer pizza? Plus it has spinach on it, so I can lie to myself and say it's healthier than all the junk food I ate the other day. 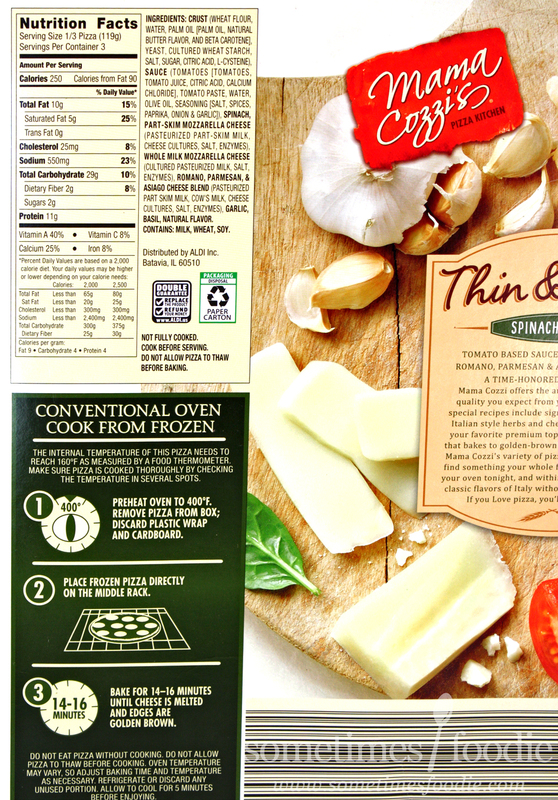 As far as function, this is just a cardboard box contained a vacuum-sealed frozen pizza. Pretty much every frozen pizza on the market is packaged the same way, but Aldi's frozen pizza designs were once pretty rough looking. Now? Look how far they've come! 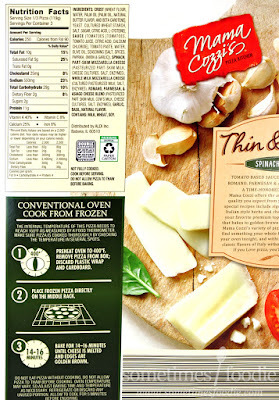 This looks more like something you'd pick up at Trader Joe's than a discount grocery store. We have texture from the wooden paddle and sprinkled flour, pops of color with the spinach leaves and scattered ingredients, and the logos? Far more polished than ever before. I am loving all this attention to detail, and even though the typefaces still teeter on the edge of looking generic, this is above and beyond what Aldi was putting out a year or two ago. The pizza instructions were very simple. Preheat. Unwrap. Place on rack. Cook. Slice. Eat. Perfect for a lazy, and miraculously un-sunburnt, beach goer like me. It cooked up in no time. 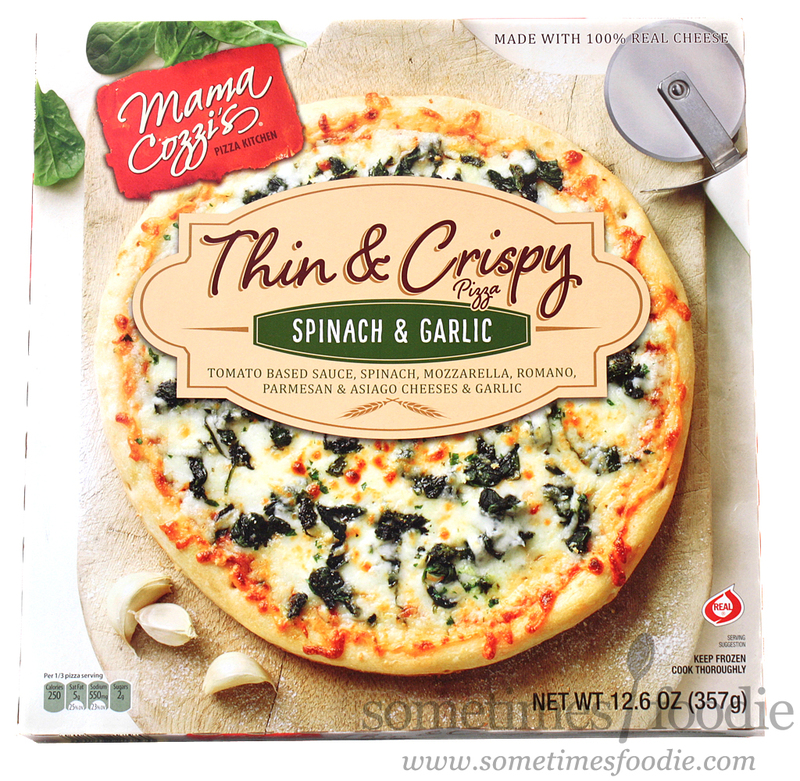 When I first spotted this in the freezer case I had really hoped that it was a mini version of my beloved specialty thin-crust spinach pizza, but sadly...it's not. It's not bad for a frozen pizza, but it doesn't pack the same flavorful punch as my (possibly discontinued) favorite. We have a thin crispy crust, plenty of wilted spinach, a thin layer of red sauce, and cheese. The veggie bits taste surprisingly fresh, considering they were frozen, but the flavor profile just isn't as rich as I had hoped it would be. I think it's the layer of red sauce that's really hurting this one. 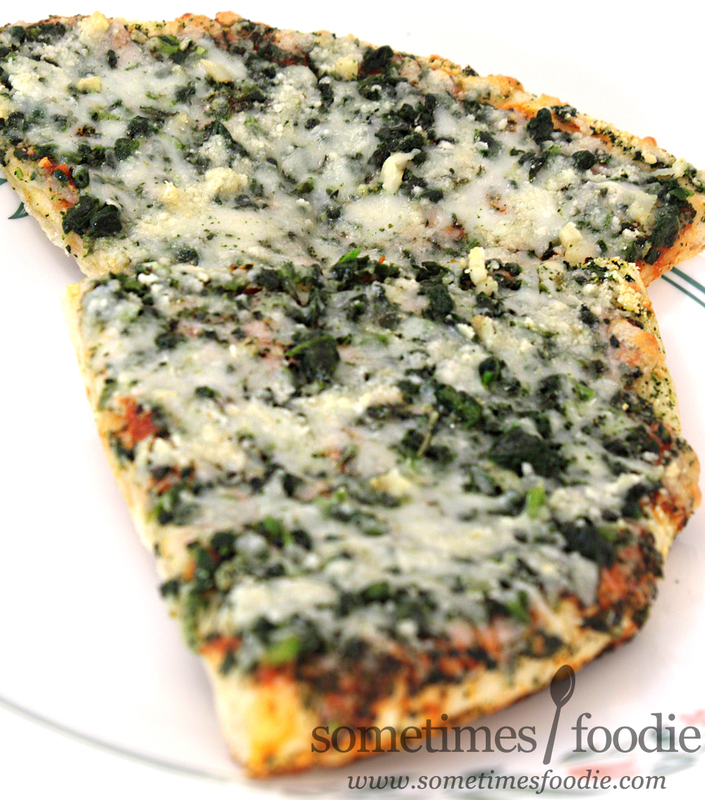 The red sauce is a little bland and generic tasting, kind of like canned pasta sauce, and it adds a mild acidity to this pizza that just doesn't work as nicely with the cheese and spinach combo as a white pizza-sauce or base would have. 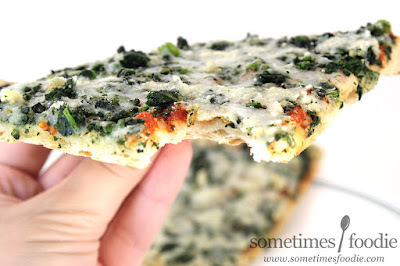 Aldi spoiled me with the Spinach and Feta pizza. This one just doesn't compare. Don't get me wrong, I still happily ate this entire thing, but I probably wouldn't repurchase this specific flavor again.